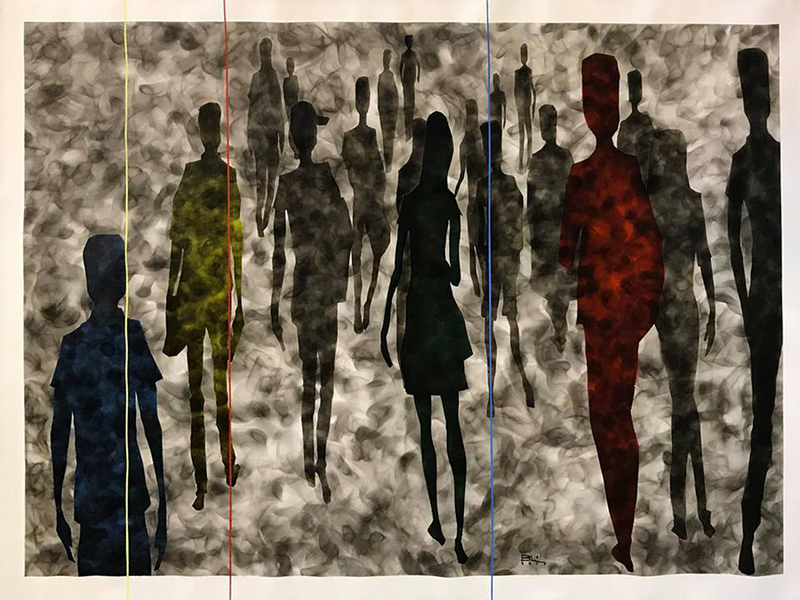 YANGON—Artist Brang Li metaphorically depicts large crowds of people moving like zombies in confusion and numbness before a smoky grey backdrop. “Our minds have been poisoned all our lives. We grew up under various illusions that Myanmar would be shattered, Myanmar would become a Muslim country and so on. People, like zombies, are unable to know whether such narratives are right or wrong. I feel like that,” said Brang Li. 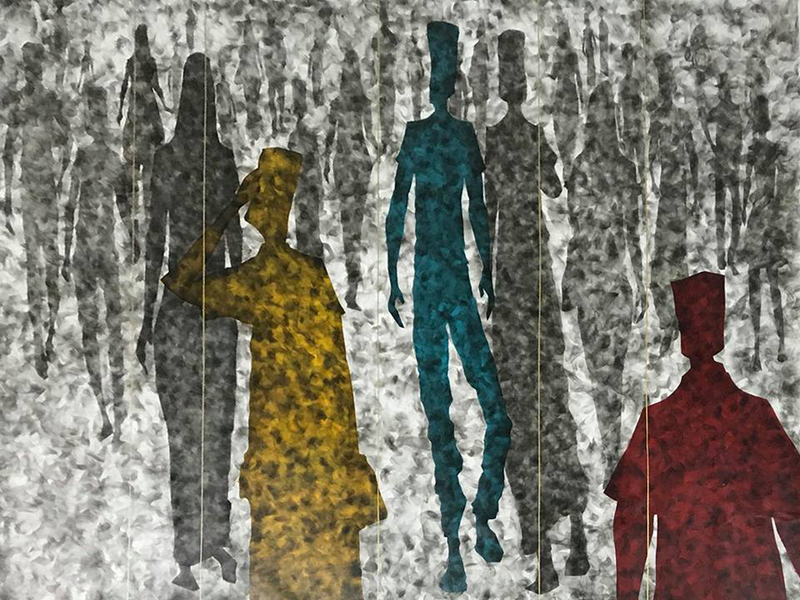 Paintings of such crowds can be seen at the Life and Shade art exhibition currently showing at Nawaday Thalar Gallery on Yawmin Gyi Street in Yangon. Brang Li, as a member of the Kachin ethnic group, is familiar with battles and has always depicted the tough lives of IDPs in his smoky paintings. He said the smoke in his paintings represents the smoke that comes from explosions of gun powder. However, this time he has turned his attention to subject of crowds of urbanites, including children, women and men who are going to markets with their baskets, to work with their backpacks and to nowhere in disorientation. He said that society, the mind of which has been poisoned, is always fumbling in darkness. Altogether 15 paintings measuring 4 feet x 3 feet and 8 feet x 6 feet will be displayed at the exhibition. 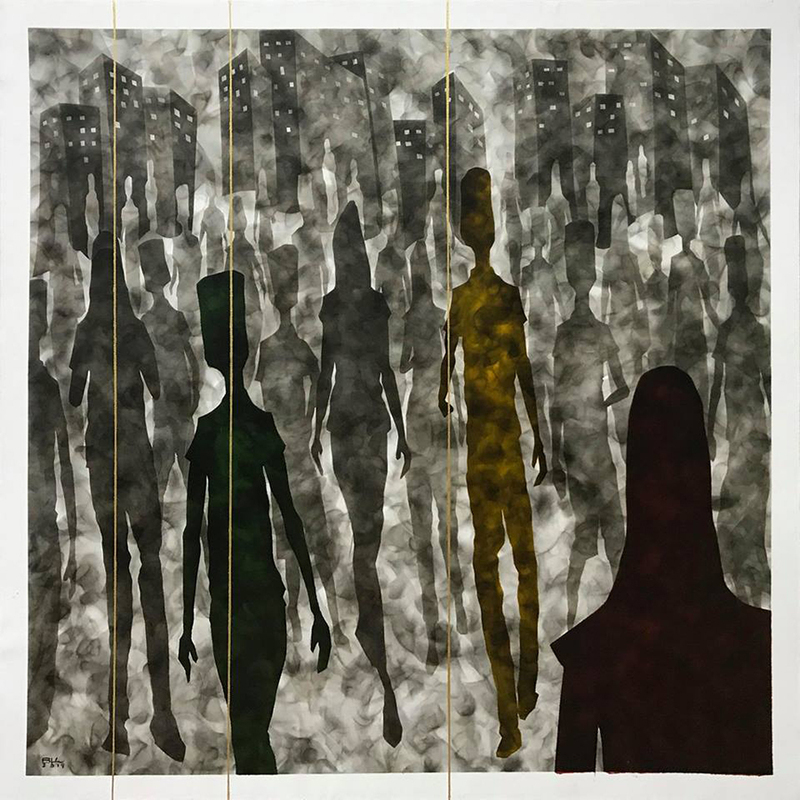 Brang Li is an art graduate from the University of Culture and has participated in a number of art exhibitions. He usually uses smoked canvases for painting his subjects on. He said this technique is the perfect way to depict the smoke of wars, gun powder and illusions. “All his series highlight the issues we must treat very seriously and remind us of them. His integrity in art enhances his creativity,” said Ko Pyay Wai, the owner of Nawaday Tharlar. The Life and Shade art exhibition runs until Feb. 15.